It sounds like the opening scene of a horror movie: a dog in Long Island was playing with its owner and stopped to take a drink from a local pond. A short while later, the poor Jack Russell terrier started convulsing and suddenly died. The cause? A dangerous strain of blue-green algae that has recently been spotted in a number of Southampton waters, including Mill Pond in Water Mill and Agawam Lake in Southampton Village. 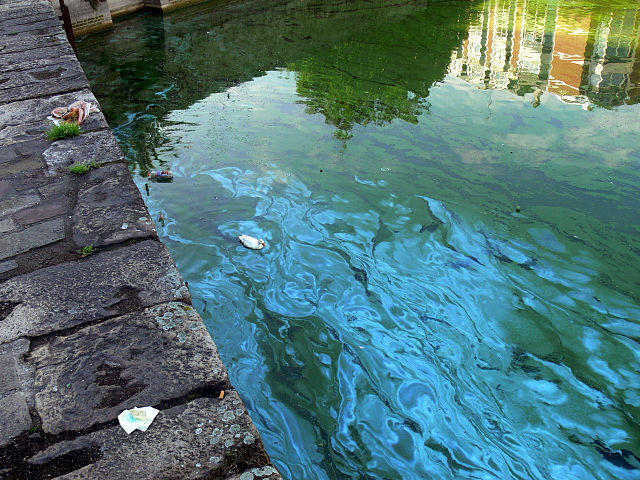 The deadly algae, better known as cyanobacteria, is the result of fertilizer, pesticides and other chemicals washed into waterways by stormwater runoff. Residents have been advised to steer clear of any body of water that shows contamination, and to keep children and pets away as well. Algae blooms most frequently occur in waterways saturated with nitrates from things like fertilizers and septic tanks. These nutrients put the algae into overdrive, especially during hot weather when the water is calm. Although most algae is harmless (if a little gross), blue-green algae, technically known as cyanobacteria, poses a serious health risk to people and animals. “Symptoms can include nausea, vomiting, diarrhea, skin or throat irritation, allergic reactions or breathing difficulties. Blue-green algae can also produce toxins that affect the liver and nervous systems when water is consumed in sufficient quantities,” explains the NYSDEC page on algae blooms. Water containing blue-green algae may appear discolored in shades of green, blue-green, yellow, brown or red. There may also be scum on the surface. NYSDEC advises that anyone who comes in contact with it should wash all surfaces with soap and water or rinse thoroughly with clean water to remove algae.